Diet Soda: Is it Really That Bad For You? We hear time and time again the recommendation of just eating real food when it comes to maintaining health and fitness. If you’ve ever read the label on a can of diet soda, you know that these beverages could not be further from real food. I’ve been told over and over that diet sodas are bad, but why are they bad, and what is the effect they have on the body? Here’s what I found. History While the official beginning of the diet soda era can be traced back to 1952’s No-Cal drink, distributed by a small Brooklyn bottling company, mainstream diet soda production and consumption really didn’t start until 1963 with Coca-Cola’s introduction of Tab. Since then, companies have been battling to find newer sweeteners and marketing their beverages to consumers in search of no calorie drinks. Artificial Sweeteners The main actor in diet soda is the artificial sweetener. Chemicals like Aspartame mimic the effects of sugar, but our bodies interpret this as a much larger dose, up to 1000x that of sugar. This sends the body into fat storage mode, which explains the link between diet soda and obesity. Some studies have shown that these artificial sweeteners actually stimulate our appetite, which in no way defines the word diet. Addiction The combination of caffeine and aspartame cause a short duration addictive high to be experienced, much like the effects of cocaine. Frequent use can cause overstimulation of the brain’s neuroreceptors, which causes more cravings of the drinks, and horrible headaches should you miss a dose. Trickery With “diet” on the logo, some may be led to think they are drinking a healthier drink. But studies have shown those who drink diet sodas consume on average 200 calories more than someone not drinking diet soda. The misleading name may cause people to think that their beverage is calorie free and thus healthy to them, so that helps justify the 800-calorie cheeseburger they are gobbling up. 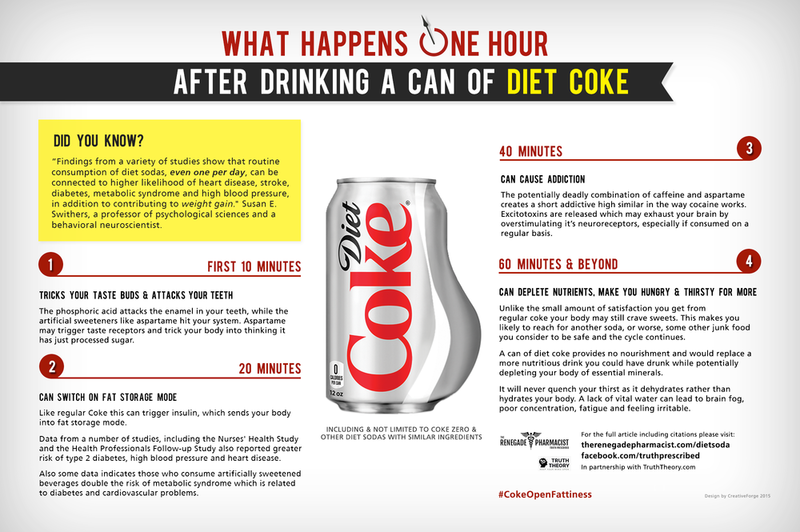 So what happens when you drink a diet soda? This graphic sums it up nicely. What are the health risks? Studies have shown links between diet sodas and increased risk of type 2 diabetes, obesity, high blood pressure, stroke, and dementia, and loss of bone density and cardiovascular and thyroid problems. Long-term exposure to diet soda has shown damage to the skin, muscles, heart, and kidneys, with increased risk of developing kidney stones. More immediate effects can be brain fog, dehydration, and energy spikes and crashes. So if diet soda is this bad for you, how is it still allowed to be sold? The answer is simple, money. The soda industry is a multi-billion dollar industry, with some estimates putting diet soda drinkers at 1 out of every 5 Americans. The soda companies have a lot of weight they can throw around, influencing studies to their benefit, advertising to millions of potential customers, and greasing the palms of legislators to keep their dangerous cocktails on the market shelves. Alternatives If you are a diet soda drinker, it will likely take some time to wean you off these drinks. You’ll need to replace them with something healthier for you. Examples are water (perhaps sweetened with honey, lemon or lime), green tea (provides caffeine without the jitters), Kombucha or Kefir tea (both are fizzy and provide other health benefits), vegetable or fruit smoothies, and, if you must drink soda, look for beverages sweetened with Stevia instead of aspartame. You may have noticed I didn’t recommend that you just drink regular sodas. They can be just as bad as diet sodas, causing many of the same maladies, and some new ones. Parting ways with diet soda won’t be easy. The soda companies don’t want it to be. You may need to treat it like an addiction. Enlist the help of family and co-workers to support you. Phase it out over time. But know eventually, your body will start regaining its normal functions that have been suppressed or modified by the toxins you’ve been ingesting. This will lead to a healthier, better, and happier you.